Gold prices fell to their lowest levels in over a year on Thursday, following the release of a report from the World Gold Council showing that the yellow metal has had the worst start to a year since 2009. 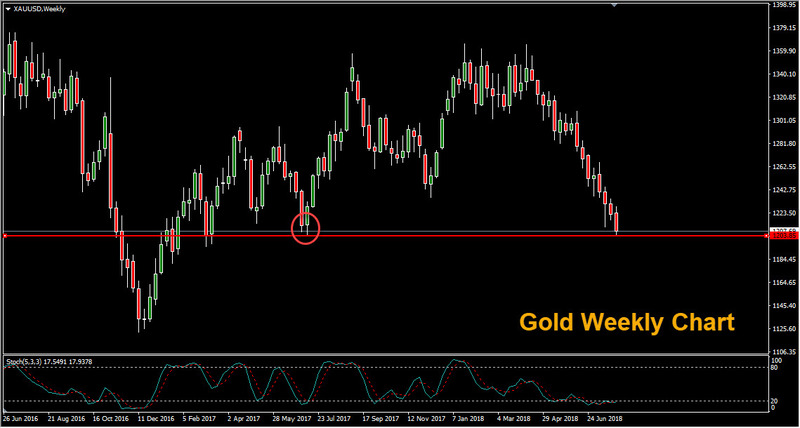 Gold continued moving lower in early trading on Friday, reaching the shelf of support made by the July 2017 lows. Despite trade tensions between the U.S. and China, gold and other traditional ‘safe havens’ have failed to be receive a boost in recent months. Meanwhile, a robust U.S economy and higher interest rates have caused investors to migrate to the dollar. The latest COT (Commitment of Traders) report indicated that while large speculators have not yet built up a net short position, they have reduced their gold futures holdings to the lowest level in years. Markets are now looking to Friday’s U.S. employment report, released at 8:30AM ET. Analysts expect that 190K new jobs were created in July and that the U.S. unemployment rate ticked lower to 3.9% in July from 4% in June. Better than expected data could underpin the strength of the U.S. dollar and add further pressure to bullion.